Jon Sewitz is 19 years old. When Los Angeles magazine’s Ed Leibowitz wrote about him and his crew of ambitious teenage chefs in 2011, Leibowitz noted Sewitz’s “round cheeks, not yet ready for their first serious shave.” Today, Jon sports a full beard, and has spent time in kitchens from L.A.’s Wolvesmouth supperclub to Café Boulud in New York to Copenhagen’s Noma, among others. Sewitz plans to head off to NYU in the fall, but before that he will join 20-year-old Kelsey Isaacs, a painting major at the Rhode Island School of Design, for Tink’s House, an “immersive dining experience” that will take place over three weeks starting July 31. The “house,” which is actually a transformed suite in a downtown office building, has four rooms—a dining room, kitchen, den and bedroom—that have been carefully constructed to evoke particular associations. For instance, the bedroom is lined entirely with memory foam to mimic the sensation of sinking into a bed. The food, too, will play on one’s notions of space; bedroom dishes include such boudoir-themed bites as poached oysters with an apricot purée and chocolate cake “mush.” Guests, dining in intimate groups of eight, will move from room to room together over the course of a meal. 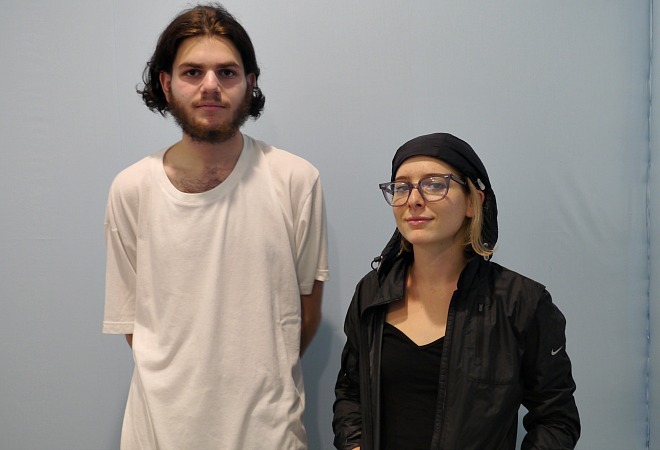 The duo (who, full disclosure, also happen to be my friends; my brother, Sam, was one of the young chefs profiled in Leibowitz’s piece) has been collaborating on Tink’s House for the past six months. Made possible via Kickstarter and an abundance of supporters, the event is finally coming to fruition this July. Here, they share with us a bit more about the upcoming project. What prompted you to want do this collaboration? Isaacs: I think the platform for it was that we were both coming from places where we were studying or working in a medium that was really specific. For example, I was studying painting and Jon was cooking. We wanted to take the core of those apart and figure out how they’re similar. I’ve seen a lot of food and art where it’s been combined so that food is really aesthetically pleasing, or food looks like art, but we wanted to make the experience completely integrated. The house is not really a traditional house. Where does that come in? Sewitz: It was important to focus on an idea and site-specific space. So the home was a good way for us to hone in and get parameters and boundaries. The idea is that you go into these rooms and the concepts are familiar, even if the space is ultimately different. For example the bedroom is lined with memory foam and sheets, the walls and everything. I think everyone will understand that the inspiration comes from a bed. Isaacs: The food in that room is based on aphrodisiacs — everyone gets to be in on the idea. Sewitz: We wanted to name it someone’s house because it was simple and because then we could then name a future project someone else’s house. We wanted a name that wasn’t confusing. So if someone were to say “I’m going to Jim’s house tonight” someone wouldn’t just respond “What, who’s Jim?” It needed to be a name that was unique. Tink had a nice ring to it. What have been the biggest challenges thus far? Isaacs: Everything has been a challenge. Raising money. Building the furniture for the space. Figuring out food. This is a huge task that’s been really, really unfamiliar but it’s honestly worked out well so far. Sewitz: I think writing our mission statement has been one of the most difficult parts of the process. It took forever to hone it down to what we want to say to people in a short time. I don’t think it’s necessarily easy to understand upon first reading or hearing about it, but people can get excited or at least curious, which should be incentive enough for them to come. What aspect of the project are you most excited about? Sewitz: There’s one aspect in every one of the rooms that I think we’re both excited about. Obviously, we’re excited about the whole project but there are definitely things we know are pretty interesting. The rug in the kitchen is going to be really cool. It’s really intricate and takes a lot of hands because we’re filling 6,000 latex balloons with flour and putting them through industrial kitchen mats. Isaacs: The latex makes it sticky, like the floor of a kitchen. How do you hope the guests interact? Sewitz: Because it’s a communal experience—and with only eight people it’s pretty intimate—we hope the environment will create conversation. You’re in a room that you’ve never been in before, with mostly strangers or at least people you don’t know super well, and you’re eating. It’s definitely intended to be intimate, but it’s not supposed to be awkward. How’s your collaboration been thus far? Isaacs: We keep each other in check. Sewitz: There have been many times where one of us has wanted to do something and the other one asks, “Is that in line with the idea of Tink’s House?” So even if we think it would be really cool, if it doesn’t necessarily serve a purpose or add to the qualities of that particular room, we don’t do it. It would just be a lot of white noise. Isaacs: We keep asking ourselves, how do we make something that’s interesting to people and that they’ll want to engage in, but that remains really genuine and honest to its own personality. Tink’s house, I hope, because of the decisions that we’ve made, is really true to itself. Isaacs: Stay tuned for Lemm’s House. Where: In a transformed downtown office space. Address will be sent out with reservation confirmation. How much: Guests name their own price. Revenue will cover costs of food and maintenance.